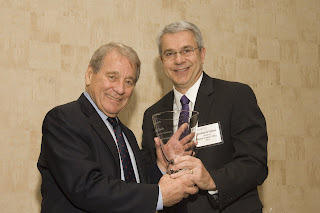 The 15th Annual National Association of Independent Colleges and Universities (NAICU) Advocacy Award was presented to Congressman Ralph Regula Tuesday evening by Dr. Richard F. Giese, president of Mount Union College, at an awards ceremony held in Washington, D.C. The award was in recognition of Congressman Regula’s lifetime commitment to higher education. “Throughout his 33 years on the House Appropriations Committee, Ralph has made federal funding for education, and especially the core student aid programs, a top priority,” said Giese.